If your kids are Disney Pixar flick “Monsters University” than you have to catch our Free App of the Day. Monsters University: Catch Archie is a fun game where players have to catch Archie the Scare Pig – the mascot of the school. 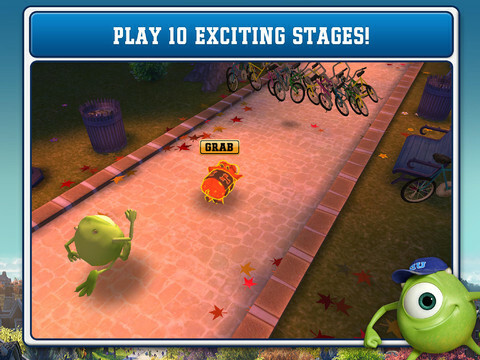 Get ready for the launch of Disney•Pixar’s upcoming film “Monsters University” with this monstrous new app! Join Monsters University freshman Mike Wazowski on his first day of college, and catch Archie the Scare Pig! Get a hold of the squealing mascot of Monsters University’s rival school, Fear Tech, in this thrilling mini game based on the film. * Don’t let Archie out of your sight: Run as Mike, and find a way to grab Archie the Scare Pig and tire him out to win each stage! * Chase after Archie in 10 exciting stages: Go for the high score to get 3 stars on each stage. * Swipe to jump, slide, and dodge obstacles: The campus is full of surprises, so watch out for tricky obstacles! * Level up Mike to unlock power-ups: Run through the Monsters University campus, and boost your score by picking up special items! Catch Archie the Scare Pig today, and remember to check out “Monsters University” in a theater near you starting on June 21st!